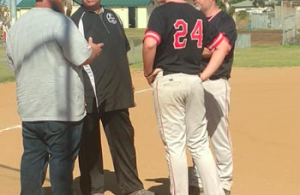 SANTEE (3-18-16) — Looking to get back to their winning ways the host Santana Sultans were able to do so as they tamed the Tigers of Imperial in a slugfest in the opener of the Hilltop Tournament 14-9 in Santee Thursday (Mar. 17). Things didn’t look good early for the Sultans as Imperial was able to push across three runs in the top of the first to lead 3-0. However in the bottom of the first the offensive fireworks began as leadoff hitter MADDY MENDEZ (3-4, 4 RBI, R, 2B) started things off with a walk, ERICA REID (RUN) came in as a courtesy runner. The next two batters MACKENZIE BENNETT (1-4, R) and SYDNEY VATES (1-2, 2 R) both drew walks to load the bases, up came cleanup hitter RACHEL WILSON (3-4, 4 RBI, 2 R, HR) who on the very first pitch, absolutely hammered it over the left field fence for the grand slam long ball. The Sultans now led 4-3. They would score a couple more runs as Mendez helped her own cause as she blasted a double to left that scored both JORDAN TEEGARDEN (1-4, R) and SHELBY HOLMQUIST (2 R). The lead for the Sultans wouldn’t last as the Tigers were able to score three runs on four consecutive hits to tie the score at 6-6. Mendez who started the game for the Sultans shut down Imperial as she only allowed a couple of hits in the fourth, fifth and sixth innings. Santana really exploded offensively in the bottom of the fifth as they scored eight runs to lead 14-6 thanks in part to a 2-run double by CELINE MENARD (1-3, 3 RBI, 2B). The scoring for the game wasn’t done as the Tigers were able to plate three runs in the top of the sixth to make it 14-9. That was the closest they would get as Mendez was able to get a couple of ground outs and a fly out to end the inning. MATER DEI 3, PATRICK HENRY 0 – The host Mater Dei Crusaders behind their ace KELLIE WHITE shut down the Patrick Henry Patriots in non-conference play 3-0 in a clash of top teams in the county, Thursday (Mar. 17). The Patriots were limited to only four hits on the day and never really threatened to score except in the second inning when they were able to put runners at second and third but couldn’t push them across. Both teams had their aces in the circle so runs would be at a premium. Henry ace MADISON JAMES matched White inning for inning for the first four innings as she shut down the Crusaders. Unfortunately it would be the Crusaders that would break through with a run in the bottom of the fourth inning to lead 1-0. They would score two more in the bottom of the sixth. For the Patriots, leadoff hitter ANYA VANDERSIP would collect two hits on the day as she went 2-4. 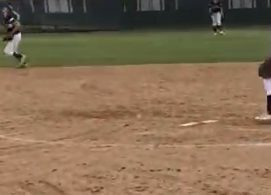 WEST HILLS 5, OLYMPIAN 1 – In Falcon Fiesta Tournament action in the South Bay the West Hills Wolf Pack pounded out 13 hits to down the Eagles of Olympian 5-1, Thursday (Mar. 17). The Wolf Pack got a run in the first inning as leadoff hitter BROOKE ROBERTS (2-3, 2 R, 2B) banged a double and would be knocked in by SIERRA SCHLICTING (1-4, 2 RBI) to lead 1-0. The Eagles would match the run to tie the score 1-1 in the bottom of the second inning thanks to multiple base hits. Both teams would shut each other out in the third inning. However West Hills would take the lead for good as they were able to push across a run in the top of the fourth inning to lead 2-1 as Schlicting knocked in ALYSSA BUBAR (2-4, R) who had singled early in the inning. The bats of the Wolf Pack did it again as PAIGE BOWLER (2-4, R, 2B) led off with a booming double and would come in on a single by CARLY BURSCH (2-4, RBI) to make it 3-1. They would tack on the final two runs in the sixth as Roberts singled and would score on a double by KENDALL MARINISI (2-4, RBI, R, 2B), who scored on a single by ALEX GUAY (1-4, RBI). Besides helping her cause at the plate, Bursch in the circle tossed the victory as she only gave up the one run which was earned on seven hits and struck out three on the day. STEELE CANYON 5, VALHALLA 2 – The Steele Canyon Cougars took advantage of their opportunities in their 5-2 victory over the host Valhalla Norsemen in the Hilltop Tournament, Thursday (Mar. 17). Steele Canyon in the top of the second was able to score a run against the Norsemen without the benefit of a single hit to take the 1-0 lead. MAKAYLA McCARTHY reached base on an error and scored thanks to a couple more Valhalla miscues. In the top of the third the Cougars put together more runs as they were able to push across four more to make it 5-0. Leading things off SAMANTHA MILLER singled, HANNAH DUDLEY reached on a sacrifice bunt which moved Miller up, GENTRY HOFFMAN singled moving runners up. MACKENSIE PEARLSTEIN was able to draw the bases loaded walk which scored Miller, Dudley scored on the sacrifice fly by AUDRIE BAGGE, and Pearlstein would score on a sacrifice fly. Valhalla would put together some runs in the bottom of the fifth inning as GIANNA PAAPE led off with a walk, the next two batters were retired. So with two outs BRANDI KOHEL stepped to the plate and laced a single to left advancing Paape to second, SAMMY GREEN singled up the middle advancing the runners, KENNEDY LABSHERE then proceeded to blast a double to left that scored both Kohel and Paape to make it 5-2. Unfortunately that would be the closest the Norsemen would get as the Cougars would get out of the inning. Steele Canyon would set down Valhalla in order in the bottom of the seventh. This was a strong day in the circle by McCarthy as she tossed the complete game. On the day she only gave up 2 runs, walked 2 and struck out 4 as she scattered 8 hits. UNIVERSITY CITY 4, CHRISTIAN 3 – University City traveled to Christian High to take on the Patriots in the Jaguar Classic and was able to garner the 4-3 victory, Thursday (Mar. 17). The Patriots got on the board first without the benefit of a hit to make it 1-0. SILENT RAIN ESPINOSA (0-2, 2 BB, 2 SB) led off with a walk and stole second, ASHLEY CARTER (1-2, SB) got hit by a pitch, ANNA SHERBURNE (0-2, RBI, BB) drew the walk to load the bases and SHANNON McMAHON (0-2, RBI, BB) hit a sacrifice fly to right field that scored Espinosa. University City answered with a couple of runs in the top of the third as they were able to take advantage of miscues by the Patriots to take the lead 2-1. They would tack on the other two runs in the top of the fifth to lead 4-1. It was all the scoring between the two teams until the Patriots finally broke through again in the bottom of the sixth. Espinosa would reach on a fielder’s choice, Carter would reach on a fielder’s choice as well. Espinosa would score as she stole home and Carter would move to third on an error. She would come in on a sacrifice fly by Sherburne to pull within one at 4-3. However the threat would be stopped a couple of batters later as TENAY BANEGAS, who had doubled in her previous at bat, popped to short for the third and final out. 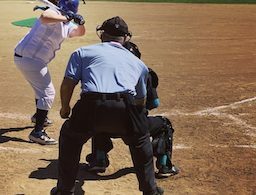 HELIX 12, BARSTOW 6 – The Highlanders overcame some defensive struggles to double up on visiting Barstow 12-6 in the Duds by Dudes Tournament, Thursday (Mar. 17). Helix would make it 1-0 in the top of the first thanks to a leadoff walk by BRIANA REED who would score on a double by DESTINI BULLOCK (3-4, 2 2B, 3 RBI). Barstow would knot the score even in the bottom of the first. However the Highlanders would take the lead for good in the top of the third as they pushed across five runs to make it 6-1. For Helix, VICTORIA CYMAN singled, Bullock singled and MCKENZIE FLORES (2-2, 2B, 4 RBI) knocked in a run with a double, and GABBY OLIVARRA knocked in two runs on her triple. Taking the circle and garnering the victory was SHAREENA LaCHANCE who upped her record to 5-1 on the season. SERRA 6, HIGH TECH SD 4 – The Serra Conquistadors overcame an early deficit to garner the 6-4 victory over visiting High Tech SD in the Duds by Dudes Tournament, Thursday (Mar. 17). Things got interesting early on as High Tech jumped out to a 2-0 lead but that would be erased in the bottom of the first inning by Serra. The Conquistadors erased the 2-0 lead thanks to a leadoff walk by DARBY TIBBETTS (RBI, R), VIVIAN TOMOVICH (RUN) reached on an error and Tibbetts moved to second. Up came AMBER WOZNIAK (1-3, 3 RBI, HR, R) who crushed the 3-run bomb over the left field fence for the 3-2 lead. They would add another run as TAYLOR CURLEY (1-3, R) singled and she would score later on. High Tech SD would tack on a run in the top of the second inning to pull within 4-3. However Serra would extend its lead in the bottom of the fourth as JORDAN GRAVES singled and was replaced by JAELYN ROBINSON as a courtesy runner. She would come around to score to make it 5-3. Serra would make it a 6-4 game as SELA FALLON led off with a double in the bottom of the sixth. She would score a couple of plays later on a ground ball. High Tech SD would push across another run in the top of the seventh thanks to the leadoff batter reaching on an error and stealing both second and third base, she would score on a sacrifice fly. For the Conquistadors in the circle, Tomovich got the win as she allowed four runs in the seven innings. She struck out three and walked none on seven hits. BONITA VISTA 10, EL CAPITAN 0 – It just wasn’t the visiting El Capitan Vaqueros day as they traveled to the South Bay to take on the Bonita Vista Barons who defeated the Vaqueros 10-0 in 5 innings in the Hilltop Tournament, Thursday (Mar. 17). The Barons rang up their runs over the first three innings and collected 13 hits on the day. Unfortunately it just wasn’t the Vaqueros day as they were limited to only one hit on the day which was a single in the top of the fourth by ALLYSON VON YOKE (1-1).